I never got involved in the dirt and the details of an investigation. I never let my preconceptions muddy a reconstruction. And I steadfastly refrained from ever allowing my past to dictate my future. At least until the one person I couldn’t lose went missing. Because then I’d relive every dark moment of my childhood, confront every heartbreak, and even sell my soul if that was what it took to get her back. Because I couldn’t accept a future — not even a promised one of immortality and unbridled power — that didn’t include one of the only two people I’d ever truly loved. This 76,000 word urban fantasy is the second book in the Reconstructionist Series by author Meghan Ciana Doidge. Author’s note: the ideal reading order of the Reconstructionist Series is after the first six books in the Dowser Series and the three books in the Oracle series, but it's not absolutely necessary to read the Dowser or the Oracle series before reading the Reconstructionist Series. Meghan's books read like they were meant to be movies. The action is great, the imagery clear. And the stories are fun! Looking forward to the next one! An other incredible book, by an incredible author. SherBear Book Review Reconstructionist # 2 by Meghan Ciana Doidge@https://madebymeghan.ca/novels/ Well guys, this story is incredible, however, I'm getting ahead of myself. First, you do not have to read The Dowser and Oracle series to read The Reconstructionist series, but in my opinion I'd recommend doing so as a way to get to know all the characters. The Adept universe has incredible characters that you'll come to know and love throughout the Adept series. It starts with the Dowser Series, blending into The Oracle series, then back to The Dowser series, and finally, into the Reconstructionist series. (see made by Meghan.ca, for correct reading order). You first meet Jade in the “Cupcakes, Trinkets, and Other Deadly Magic” book, along with other characters that reappear in all of Meghan's books pertaining to the Adept World. Now back to “Tangled Echoes”, Reconstructionist #2. We first met Wisteria in the Dowser series, which peaks our interest by wanting to get to know her better. Wisteria meets Kett's in “Catching Echoes”, where she is hired to take, & make, reconstructions of a murder along with working with The Witches Council and The Conclave, aka Kettil The Executioner. This story grabs you from the first paragraph and you can't stop reading. Wisteria is complicated, quiet and reserved. You come to understand that her past is tormenting her, and keeping her from understanding what she is capable of. 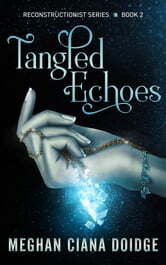 The ending is a major cliff-hanger that ensures you have to read book 2, “Tangled Echoes”. Starting from the opening paragraphs on page one, you will learn Wisteria has been given a major choice, one which will change her life forever (sorry no spoilers). You'll love this next story as Wisteria and Kettle change and grow to understand what they are possibly meant to become. This is another incredible story from Meghan Ciana Doidge. Can't wait for Reconstructionist #3 to be released. I'd highly recommend this series from beginning to end. ⭐️⭐️⭐️⭐️⭐️ If I could rate higher I would! An awesome read, Enjoy!!!!! 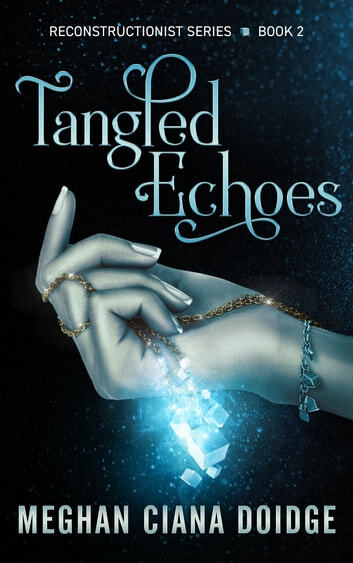 Like all Meghan Ciana Doidge's books, Tangled Echoes is excellently written. The story pulls you and keeps you mesmerized until you reach the last page. Her characters are interesting, captivating and addictive. By far, my favourite author. I can't wait for her next book! Wow! Meghan has done it again. I love the relationship that has grown between Wisteria and Kett. Reading her stories really do feel like meeting up with good friends. Thank you Meghan for another well loved story! Enjoyable and hungry for more. As with the other books set in this world I enjoyed reading this story. It can becread as a stand alone book but it is so much more enjoyable when read in the recommended reading order with the other books. I have recommended these books to my wife to read.